Since 2005, we have been working on our progress and expansion. Like every road to success, ours was not an easy one, but we got throught it all and we became, as once planned, the leading company in coconut shell charcoal worldwide. 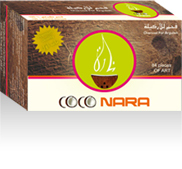 Sharbel Dabaghy, CEO and Founder of Beirut Eco Traders, Pionara and BETS Offshore, is the man behind the legends of Coco Nara™ and Coco Mazaya™. With more than fifteen years of experience, Sharbel Dabaghy has become known internationally for his vision in defining the new standards for charcoal in the world. Sharbel Dabaghy’s story began in 2002 when he envisioned and started to develop an eco-friendly charcoal, which ended up in the shape of a cube, made from the shells of the coconut fruits and which was to become a solution for the growing hookah industry worldwide. In 2004, the project had reached completion and in 2005, Coco Nara™ saw the light, and efforts were joined with Raed Haidar, Partner and Cofounder, and the success story started expanding. Later in 2010 Sharbel Dabaghy introduced Coco Mazaya™, to prove later that it was the next leading brand. 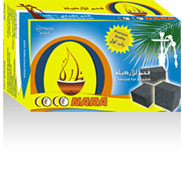 In less than 10 years the two partners, Sharbel Dabaghy and Raed Haidar, have revolutionized the perception of charcoal and its applications worldwide. As an entrepreneur, Sharbel Dabaghy keeps his companies ahead of the competition, through creativity and continuous innovation, along with upholding the trust of both clients and employees. Today Sharbel Dabaghy manages more than 2,000 employees, across the globe, fulfilling all roles to stringently meet all customer demands and to maintain the product at the highest of international standards. 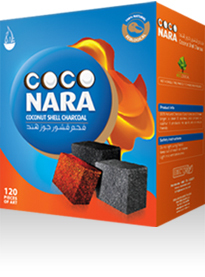 There are many companies or people who claim to be the real suppliers of Coco Nara™, be careful not to be deceived by the appealing offers they may make or the shiny prices, at the end every thing comes at a price. We have been contacted by many people visiting our website and claiming that they received bad quality, and we found out that they did not buy from us, but rather from some impersonating party that gave them an appealing offer!